This October, we’re challenging ourselves to watch at least one horror movie a day. Today it’s time for the debut feature from the director of Netflix’s newest must-watch scary show. With Mike Flanagan’s Haunting of Hill House hitting scheduled to hit Netflix on Friday, it seemed a good time to look back at 2013’s Oculus. He’s made better films since (I’m a huge fan of Hush), but Oculus examines themes that seem of apiece with the upcoming Hill House. It’s about past horrors revisiting the present day and the scars they can leave behind. Oculus centers around two siblings, Kaylie and Tim Russell (played by Karen Gillan and Brenton Thwaites in their adult incarnations). Tim has recently been released from a mental hospital, held there for claiming supernatural forces caused his parents’ deaths. Kaylie works at an auction house and has spent her time researching and tracking down the nefarious mirror she believes caused all of her family’s agony. Her goal is to take Tim and work together to clear her father’s name and finally destroy the Lasser glass. The film also intercuts with flashbacks to that pivotal time when her father (Rory Cochrane) purchased the mirror and both his and her mother’s (Katee Sackhoff) descent into psychosis. The film’s cast assists in elevating the film above other, weaker horror fare. Gillan and Sackhoff are each sci-fi icons due to respective roles on Doctor Who and Battlestar: Galactica, and they commit fully to playing their characters’ mental trauma and anguish. Sackhoff is especially strong as a woman who begins the film as a loving mother and ends the film as the human equivalent of a rabid dog. Gillan’s character, by contrast, begins the film as a ruthless, perhaps deranged, presence. Her plan to destroy the mirror, while remaining free from its influence, oozes psychopathy, but Gillan is such an engaging performer that we have tremendous goodwill towards her. She’s too likable a screen presence to turn against. The ways in which the film bleeds together both the past and the present, as well as reality vs. illusion, distinguish Oculus from being a simple story of a demonic mirror. 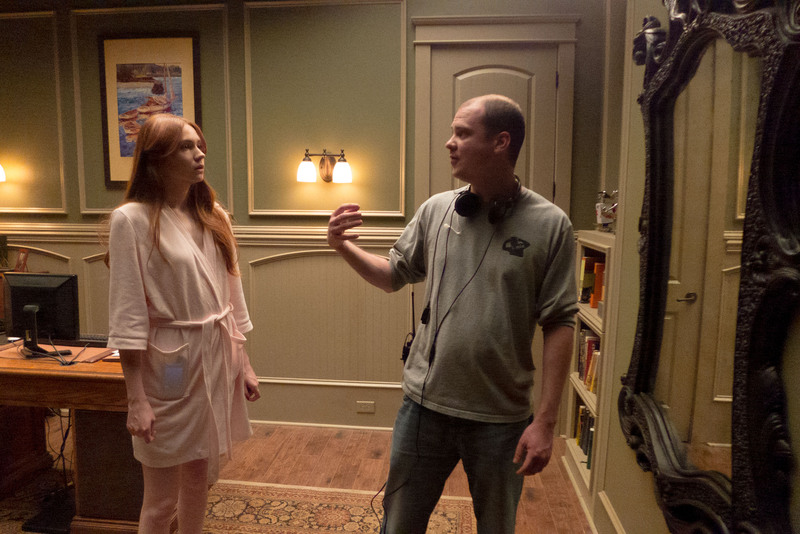 As the adult Kaylie and Tim fall deeper into the Lasser Glass’s version of reality, their childhood counterparts (Annalise Basso and Garrett Ryan Ewald) also appear throughout the house, forcing the viewer to question the film’s reality in the same way its characters must. It’s the ultimate embodiment of the past resurrecting to destroy you. Hallucinations blend with the tangible and past and present collide to such an extent the viewer remains as off guard as the characters. Flanagan’s directorial work is flawless so that even when the film’s narrative twists rely on massive logic departures, its visual style keeps the viewer engaged and admiring of its technique. Oculus‘s narrative logic feels dubious at best, and the true nature of the Lasser Glass remains too under-explained to feel credible. I understand the impulse to keep its origins vague, as well as the belief that explanation drains horror from a story, but some sort of explanation beyond, “well, it’s an evil mirror, and it’s killed a lot of people” feels warranted. As a result, the film’s story-line becomes increasingly muddled. All of thevisual and timeline sleight of hand leads to an ending that feels appropriately devastating but also a bit unsatisfying. It also becomes obvious fairly quickly that Kaylie’s plan to take on and defeat the mirror isn’t going to be successful, and the only explanation for the two of them not simply cutting their losses and fleeing seems to be that there’s no movie if that happens. I’m pretty forgiving of logic leaps in trashier slasher and horror films, but Oculus has loftier ambitions, so its logical failures feel more like actual failures. Once the viewer begins picking at the film’s dangling threads, the haphazardly stitched together narrative sweater completely unravels. The film is never less than watchable, but it’s visually so strong that it makes me wish it was better than it actually is. Nevertheless, with Oculus Mike Flanagan shows his technical skill when it comes to using visuals to create tension and blur timelines. Narratively, he was still progressing, but his promise was there. As it is, Oculus exists as an effective exercise in tension and narrative trickery, but it lacks the kind of strong narrative foundation that gives the scares more of a punch. However, it does take the theme of being haunted by your past to the point that it eventually overtakes your very sense of self, a common horror theme, and presents it in an interesting way. Its reach exceeds its grasp, but its reach is admirable. Next Entry Bad Times at the El Royale Review: Why So Serious?